QEMU is a generic and open source processor emulator which can emulate i386, x86_64, ARM, MIPS, PowerPC and SPARC systems. In case of ARM, it can emulate an Integrator or a Versatile platform. The Versatile one is the most interesting as it includes a hard disk SCSI controller, an Ethernet card and a graphical display. 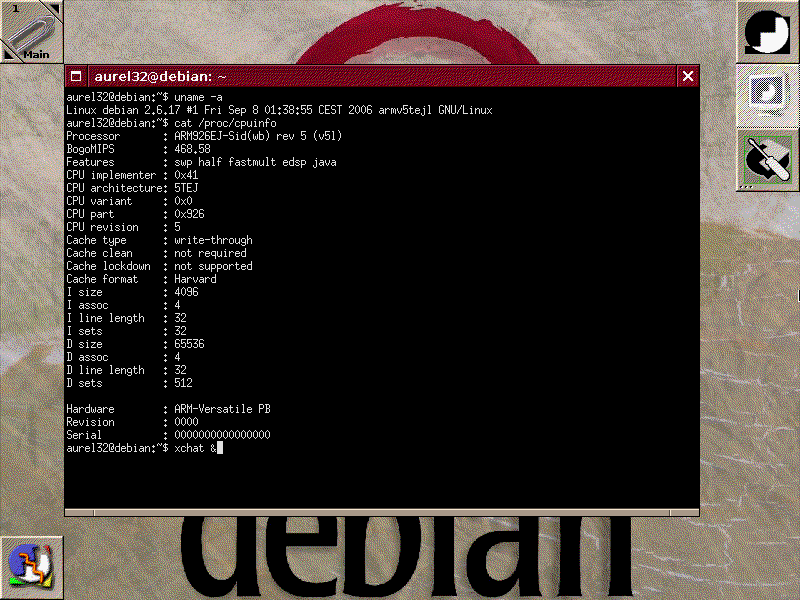 Using a kernel compiled with the right options, it is possible to install a Debian distribution on such an emulated platform. That makes a cheap development platform. The emulated system running on an Athlon 64 X2 3800+ is around 20% faster than the popular NSLU2 and possibly with much more RAM (my emulated system has 256MiB of RAM). This howto has been written for a Debian host system, but could be easily adapted for other distributions. Alternatively prebuilt images are also available. $ su -c "apt-get build-dep qemu"
First you need to create an image of the hard disk. In my case I have chosen to emulate a 10GB hard-disk, but this size could be changed to correspond to your needs. Note that the file is created in qcow format, so that only the non-empty sectors will be written in the file. A small tip: create a directory to hold all the files related to the emulated ARM machine. $ qemu-system-arm -M versatilepb -kernel vmlinuz-2.6.18-6-versatile -initrd initrd.gz -hda hda.img -append "root=/dev/ram"
Proceed as a normal installation, until you get to the following screen. If you need some documentation, please refer to the Debian installation guide. 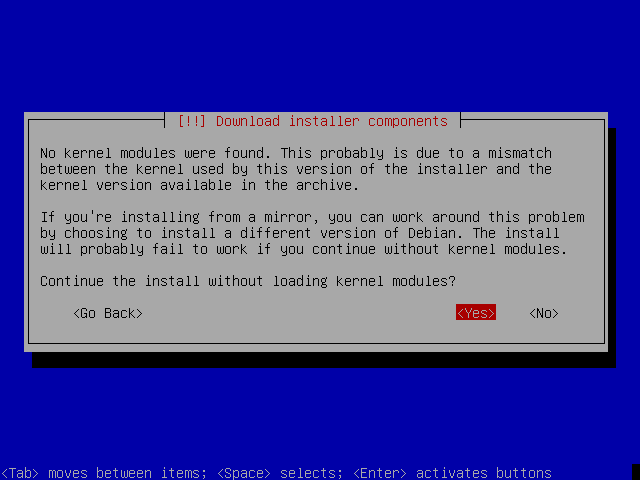 Debian-Installer complains that it can't find kernel modules. This is normal because the initrd of another platform is used. This is not really a problem as the kernel I provide has been compiled with the network driver, the disk driver and ext3 support built-in. 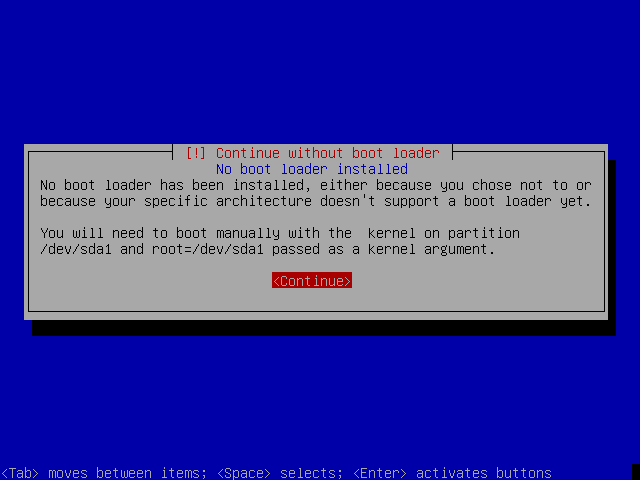 However that means you won't be able to install Debian on an XFS partition. This is a known limitation that will disappear if/when the Versatile kernel is integrated in the official Debian kernel. So in short answer yes, contrarily to what is suggested. 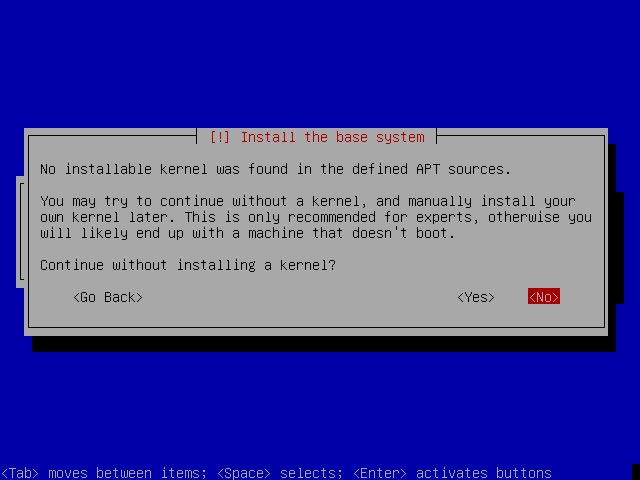 During the installation, Debian installer will complain that it can not found a suitable kernel for this platform, as shown on the screenshot below. 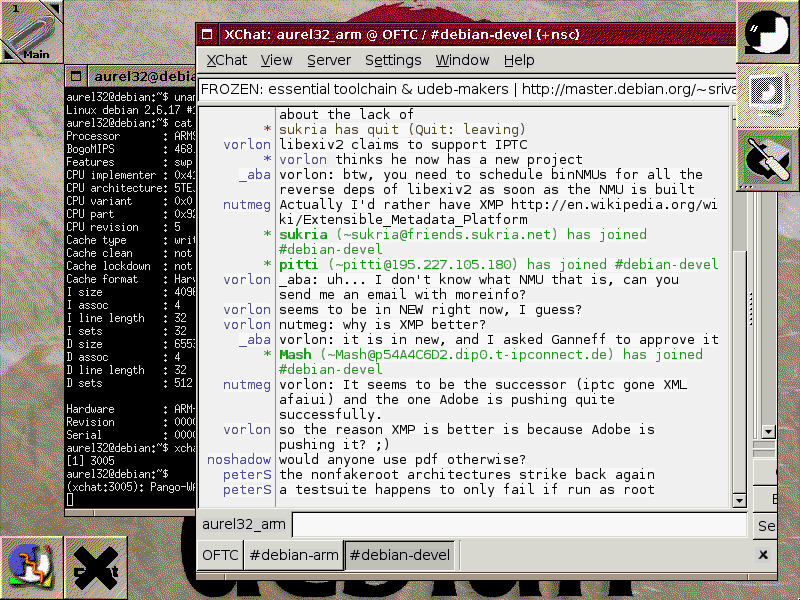 This is due to the fact that Debian currently does not support the ARM Versatile platform; the support will be added post-Etch. An unofficial kernel being provided directly to QEMU, you can safely ignore this message and continue the installation. Again consider this message as harmless. There is no need for a bootloader, as QEMU is able to directly load a kernel and an initrd. Then you will get to the end of the installation. Congratulations! When the systems reboot, just exit QEMU. Different parameters have to be used to boot the installed system. $ qemu-system-arm -M versatilepb -kernel vmlinuz-2.6.18-6-versatile -initrd initrd.img-2.6.18-6-versatile -hda hda.img -append "root=/dev/sda1"
The first thing to do is to install the kernel image corresponding to the running kernel. This will install all the modules that you may need. 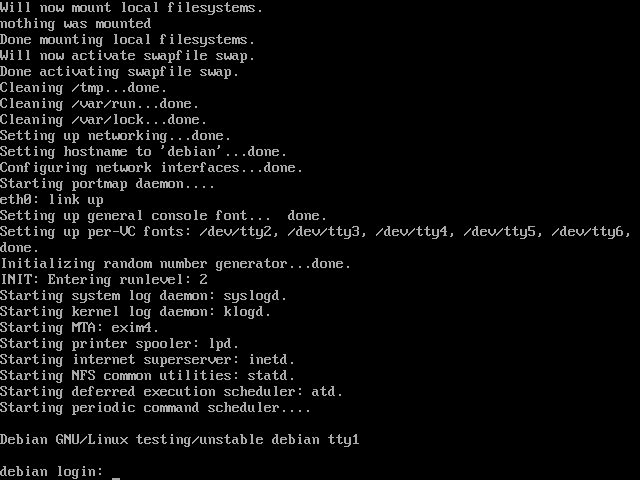 $ su -c "dpkg -i linux-image-2.6.18-6-versatile_2.6.18.dfsg.1-18etch1+versatile_arm.deb"
You now have a full Debian arm system that you can use for development or whatever. You can even run Xorg using the fb device. Note that you have to select a 256-color mode, with a resolution up to 1024x768. 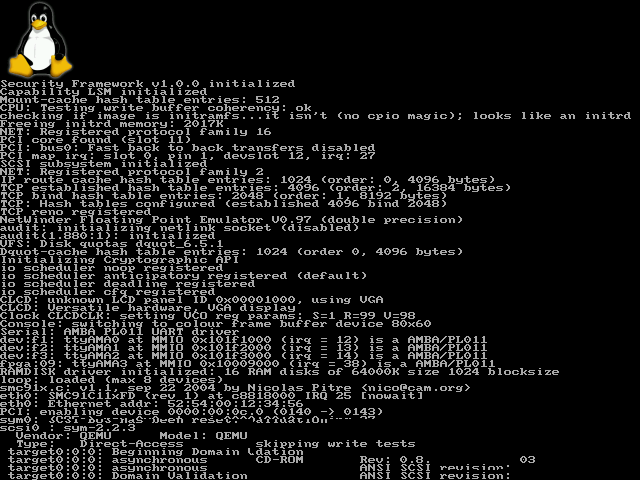 By default QEMU emulate a machine with 128MiB of RAM. You can use the -m option to increase or decrease the size of the RAM. It is however limited to 256MiB, greater sizes will crash the kernel. When no option is specified QEMU uses a non priviledged user mode network stack that gives the emulated machine access to the world. But you probably want to make your emulated machine accessible from the outside. It is possible by using the tap mode and bridging the tap interface with the network interface of the host machine. QEMU has a lot of other useful options. For a full list, please refer to the QEMU documentation.